1. Is the inspector certified by the National Association of Wastewater Technicians (NAWT)? 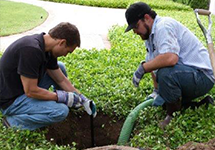 Texas does not require any license or certification for real-estate septic inspections, but we recommend that your inspector hold an active certification, relevant training, and experience. 2. Does the inspector hold a valid Texas Commission on Environmental Quality (TCEQ) license to install the type of system he/she is inspecting? Even if an inspector has a inspection certification, he/she may not be familiar with how a system should be constructed and the regulations it’s bound to. 3. Is the inspector knowledgeable about the type of system he/she is inspecting? Does the inspector have different procedures for different types of systems? There are so many types of septic and aerobic systems; there is no one-size-fits-all system, nor should there be a one-size-fits-all inspection. 4. Is the inspector knowledgeable of local real-estate inspection requirements for each county and entity? Each county may have specific regulations for real estate septic inspections. 5. What are the inspection procedures? Since there are no regulations in Texas, there is a wide range of procedures that “inspectors” may offer. We recommended that inspections are performed according to NAWT standards. All our inspectors are NAWT-certified! We also routinely provide continuing education for NAWT classes and for TEHA (Texas Environmental Health Association). All our inspectors are TCEQ-licensed installers and have a minimum of 10 years experience! Upon scheduling, we always ask questions to ensure the best inspection type is ordered for your specific situation. ← Do I Need a Septic Permit?